We still buy the lie. Women are told that if they want to be successful in the world, they have to be more like men, or like a how-to-succeed-in-business stereotype: aggressive; detached from commitments; and self serving. No softness, no vulnerability, and certainly no thinking of others. We have to put ourselves first or we will never succeed and be fulfilled. It’s in every women’s magazine, in daytime talk shows, self-help books and on the web. We have to put off having children and getting married, putting our work lives in first place above all, before our marriage. They promise that will bring us happiness. As a result, women often wait so long to get married that they frequently miss their opportunity to have children and pursue costly IVF procedures in a desperate attempt to ‘have it all’. We see this model of success at all costs in Hollywood, yet what do the biggest starlets long for, the ones who have it all, fame, money, the best roles, the perfect body and the enviably handsome man? They want time off from Hollywood to have children, to have a private life where they can devote themselves to those they love, their children and their husband. The desire to be receptive to love and to give of ourselves completely in love is built into the female heart. It is the key to fulfillment as a woman, no matter what role you play in the world. 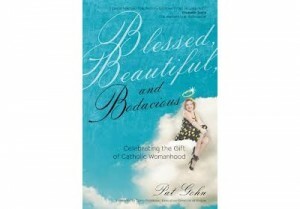 Pat Gohn in Blessed, Beautiful and Bodacious: Celebrating the Gift of Catholic Womanhood takes the reader by the hand and gently talks to her inmost soul where these desires lie ignored, gently coaxing the reader into allowing her innate femininity flourish, and blossom into authentic womanhood. I was moved by Gohn’s honest personal stories of how she evolved from a “I am woman. Hear me roar” feminist to the authentically Catholic, happy, fulfilled, self-giving woman she is today. She overcame tremendous challenges in her life and, thanks to friends who built her up and mentored her, she grew in her ability to love and give of herself. Next Article Why Don’t Women in the Developing World Use Contraceptives?